Last January Dr. Jason E. Box. research scientist at Byrd Polar Research Center, reported on his Meltfactor blog that the Greenland ice sheet was getting less and less reflective. Albedo, the reflecting power of a surface that is defined as the ratio of reflected radiation, is high when the ice sheet is covered with white snow. But as temps go up this snow starts to get darker, more of the surface below gets uncovered and a vicious cycle starts: more snow melts, snow gets dirtier, reflects less solar energy, more melt, etc. Other factors that influence the albedo of the Greenland ice sheet, is total prior snowfall, rain, and snow impurities, such as dust and soot from wildfires and human-produced pollution. The sooner the snow starts to deteriorate in spring/summer, the less reflectivity and thus more melt there will be. The image above comes from a more recent blog post on Meltfactor: Greenland ice sheet reflectivity at record low, particularly at high elevations. Albedo at lower elevations is lower, because temperatures are higher there and more of the surface below the snow/ice becomes bare. Ice sheet reflectivity this year has been the lowest since accurate records began in March, 2000. In this condition, the ice sheet will continue to absorb more solar energy in a self-reinforcing feedback loop that amplifies the effect of warming. It’s not a runaway loop, just an amplifier. A record setting melt season is likely if this pattern keeps up this year. Perhaps most remarkable about the 2012 pattern is how much darker the snow and ice is becoming, not only at the lowest elevations around the ice sheet periphery where melting is always most intense, but in the higher elevation net snow accumulation area. Those are pretty big calvings, but strangely enough, I haven't seen any reports anywhere (of course, the Cruise-Holmes divorce must take precedence). A big calving of 7 square km in 2010 received more attention. I did a blog post on it at the time, with more general info on Jakobshavn Glacier. Here's a spectacular image of Jakobhavn's calving front from April 21st 2012. I finish this blog post with two images that show what things look like on the ground. The first image is again from Dr Box's blog with the following explanation: "This is how much darker the Greenland ablation area is than a fresh snow surface that blankets it in wintertime. Along much of the southwestern ice sheet at the lowest 1000 m in elevation, impurities concentrate near the surface and produce this dark surface. Not all of the ice sheet is this dark, only the lower ~1/3 of the elevation profile of the ice sheet is. However, as melting increases on the ice sheet, so does the area exposed that is this dark." The other photo is from this NOAA ClimateWatch Magazine article and was made by Henrik Egede Lassen/Alpha Film, from the Snow, Water, Ice, and Permafrost in the Arctic report from the U.N. Arctic Monitoring and Assessment Programme. What I expect we will see if these low albedo conditions persist is 100% surface melting over the ice sheet. This would be a first in observations. It may not happen this year, but the trajectory the ice sheet is on, along with amplified Arctic warming, will have the ice sheet responding by melting more and more. Excellent work, Neven. I just ran across this work, and came here, and you already had a good summary written. The size of the energy flux is impressive. A 5-6% decrease in albedo during the summer months translates into an enormous amount of heat. And the obvious increasing loss in albedo at the edges of the ice sheets indicates what is coming for the ice sheet as a whole. The loss of ice at the edges of the ice sheet eliminates an important protective buffer for the rest of the ice sheet. Couple this with with the loss of ice pack in Baffin Bay and the ice pack shielding the east coast, should increase the teleconnection of heat onto the ice sheet. This leaves us with the uncomfortable finding that the melting rate of Greenland will continue to accelerate. And the GRACE satellite data confirm this acceleration. Hey, Paul, good to see you! A point of physics may be worth pointing out here. It's obviously appreciated already that black surfaces absorb radiation energy better than light-colored surfaces. What's often forgotten is that black surfaces also EMIT radiation (infrared, microwave, etc) better than white surfaces. See "black body radiation" in a google search. At first blush, you might think that this would help the Greenland ice sheet to cool back down during the winter. But it's likely that all this dark material will be covered over by late september with fresh snow. I would guess the only dynamic that will work to reduce the albedo of the Greenland ice sheet will be abundant rainfall -- which will surely happen eventually as the arctic warms, but that, I imagine, won't happen until the globe is very tropical indeed. Did you mean to say that rain would reduce the albedo, or increase it? I meant to convey that rainfall should wash away the dark material, tending to restore low albedo. But "abundant rainfall" and "Greenland" should never normally appear in the same sentence. Another thought about all that dark material. In summer, it causes the ice sheet to absorb more solar heat. In the winter, not only is it covered by snow, but I'd imagine it may tend to insulate the underlying ice. Over time, I'd expect the deep ice, say 100 meters below the surface, to warm up year round. I have no idea whether anyone monitors temps deep down in the Greenland Ice sheet. But if those gigatons of ice have been warming over time, the amount of summer melt for a given amount of heat absorption should also increase -- yet another positive feedback mechanism for ice melt in the Arctic. Lower albedo is lower back radiation, or? Zero = perfect absorption. Black bodies more readily absorb AND radiate heat than white bodies. This is part of why the "blackbird" spy plane is painted black--to radiate heat from air friction at Mach 3. The role of heat radiation from dark vs. white Greenland ice is wholly speculative on my part. Probably a very tiny factor in the scheme of things. At everyday temperatures, heat radiation from objects is hard even to detect. I expect a rise in rainfall along Greenland's west coast in the future, when Hudson and Baffin Bay get warmer. But I don't think rainfall will wash the dark materials away as they would tend to sink into ice until they're sunk in so much they can't get any sunlight which they could transform into heat and therefore melt. Steve, your point about albedo is a common assumption but it is wrong unless you deal with a greybody. If you a difference between spectral bands the result will different. I can tells you the story of a company that was selling very good blackbody in thermal IR, but nobody wanted to buy them because they were green at visible wavelength. If I remember correctly, snow is pitch black from NIR to end of the spectrum due to the strong absorption band of the water and texture of the snow that behaves like a photon trap. On the positive point. If enough dirt accumulate over snow the whole process will slow down as the dirt will act as an insulation layer, lime we see in spring on highways sides in Canada. Is it not the case that there is a lot of soot trapped in the ice over the centuries and as the top layers of ice melt away the remaining soot becomes more and more concentrated on the top of the remaining ice? The thing that stands out to me is that it appears Jakobshavn Isbrae has retreated beyond it's grounding line. "The JIG flows through a deep channel eroded in the bedrock (see Fig. 4). The channel has a depth of 700 m near the ice front and drops to near 2600 m further inland (Ramamoorthy, 2004)." Looks like it's all downhill for dozens of kilometers back from here. I have to believe we'll be seeing a press release in the coming months. James, this is scary. In the arctic, deep water is warmer than surface one. If it manage to go past the grounding line, we may see the whole glacier retreats at flank speed. The lowest 300 meters of ice may be impacted by wind blowing across a warm Baffin Bay and creating warm fogs sufficient to melt glacier snouts, bergs and exposed land ice in the path of the prevailing breeze. Does anyone know of any liquid path infrared imagery to support this? suppress melt (Brooks, 1979; Mernild and others, 2008). Whilst the albedo change to the icesheet maybe significant, I would suspect that the greater factor could be exposed areas of bare rock. Dark surface areas of ice will still be at around 0C. As anyone who has been on a beach holiday knows, sunlit sand warms quicker than the sea. Once the rocks are exposed, they can quickly heat up by dozens of degrees. Luckily the vast vast majority of Greenland is not susceptible to this kind of melting. And until the experts say otherwise it is just speculation. That said, the amount of glacier retreat in the past year is a newsworthy event in and of itself. I think the sill would still act as a barrier to deep water influx. 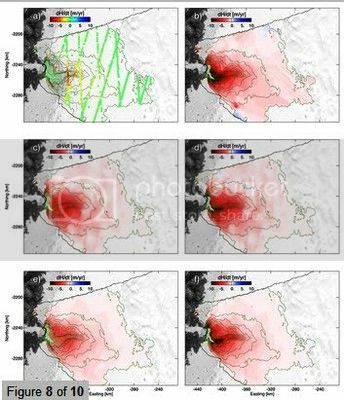 Came across this just published paper which concluded that catastrophic collapse of Jakobshavn is not likely. >"I think the sill would still act as a barrier to deep water influx. If the sill is 200m below sea level, could that leave room for surface fresh water outflow and warmer saltier water to flow in, sink and attack the lower levels of the ice stream? Or will the sill be constantly choked with ice for many decades yet preventing such circulation and/or cooling salty water close to freezing? "The apparent need for the terminus to thin to near flotation before it can calve may limit the rate at which retreat occurs. Our analysis of the processes controlling the speed suggests little potential for further large acceleration." Does this seem to be a contradiction? As it retreats to deeper parts, does that imply less thinning needed to get to 'near flotation'? Perhaps the channel was already getting deeper over the 3 years of the study? …thinning-induced change in basal effective pressure is the dominant process influencing near-terminus behavior, while diffusive processes drive the upstream response. 3. I’ve been wondering where the intense deformation of the glacier has its origin and imagined it would be intense pressure against the fjord sill/treshold; thinning of the glacier would lower the pressure, velocity and intensified calving would indeed define the terminus position. 4. I wonder what they mean with ‘diffusive processes’ upstream. That concerns the very interesting developments near the snow line, where the sheet is 1100-1200 m high. That’s also where the below sea level sheet bottom within Greenland reaches. I can imagine several high impact processes, of which deep deformation of the sheet ice through structural weakening and warmth accumulation are probably determining (Swiss Camp has already reported 50 m. of lowering over a broad area out there (2011). ...The apparent need for the terminus to thin to near flotation before it can calve may limit the rate at which retreat occurs. 5. Now that the glacier has retreated over its deeper trough, it is important to know how deep the bottom of the ice reaches. While the pressure out of the feeding sheet must be tremendous, enough to reach to 1000 m BSL at the head of the trough (60 km from the present terminus), I imagine the glacier as a ‘ lid’ on deep water over the trough in the last 20 km. You can hardly call that floating, while the trough and sheet sides provide 1000 m. of grinding contact. ...Our analysis of the processes controlling the speed suggests little potential for further large acceleration. 6. See point 2. The hypothyses and modelling on ice behaviour they used are not specified. I can only put forward my own imagination. A feeding sheet under pressure, deforming at depth, could very well provide a lot of momentum to the glacier. ...Thinning and elevated speeds may continue at rates similar to present, however, putting the glacier on course to retreat to the head of its deep trough in about a century, at which point it likely would stabilize with a thinner terminus. 7. I don’t see why this would be a conclusion that calamitous change on the Isbrae is unlikely. I think they underline that the glacier will retreat further up into its trough. What is alarmous to me is volume loss. The glacier will thin. A lot. While it will remain a visible ‘extent’. And it’s surroundings will sink. This study doesn’t have the scope to really address that. Mauro Pelti has some more info on supraglacial lakes behind Jakobshavn: Sarqardliup Sermia Supraglacial Lakes. Speaking about these seasonal lakes, at least for the time being, do we have any names for those up behind the Petermann glacier, they usually show up late July at the left side looking down the glacier, they actually look like Fjords, but far from the sea though, I wonder what will happen when or if they burst? Additional info of the lakes up behind the Petterman glacier, the 3 main lakes are about 100 km2, so we are talking loads of water. Only my supposition, but I picture a torrent of cold,fresh water rushing over the restriction caused by the sill leaving little room for back flow. Some sort of vertical gyre might be possible, but I'd assume that would occur beyond the sill structure unless there was a strong flow perpendicular to the outflow that would force the cold current to one side and allow the intrusion of warm waters. I think we may have a situation like that in Hall Basin where a counterclockwise gyre forces some of the warm, northward flowing current in Nares Strait over the southern edge of the sill. Again the above is only supposition. I consider the lakes on Washington Land as different from the supraglacial lakes Pelti is studying. Once formed they seem to persist through the melt season. I've assumed they are the kind of structures that will leave behind the hanging valleys seen where glaciers have retreated. Instead of being able to melt straight down to drain, they're confronted by an ice dam that's a constantly moving target (Petermann or Humboldt glacier. When the one blocked by Humboldt goes I've wondered if it might cause a surge on that side of the glacier. Yes they look very interesting, they seems to grow in size by the years, and one day they will do what water always do....? Mauri, sorry for calling you Mauro! The warm Atlantic water at depth is salty and has a higher density than the cold melt water from the glacier. This means that the warm, dense water can flow over the sill. When it comes in contact with the glacier melting ice makes it colder, less salty and less dense. Then it floats up and flows out the fjord, carrying bergy bits with it. This is called a halo siphon and is self reinforcing. The question is: how much warm water can flow over the sill? If the sill is high enough the warm water will be too deep. Peterman glacier is melted this way. The same effect can melt the ice shelves in the Antarctic. Werther, do you have a reference for that Swiss Camp elevation change? TIA. I'm sure the sill would interfere with this flow, but there does seem to be a mechanism that would draw warm, salty water into the fjord along the bottom while relatively fresh, cold water flows out along the surface. Doubtless some of this Siberian smoke (sat photo) will end up deposited on Greenland. Jakobshavn Glacier is a system with complex behaviors that are sometimes almost counter intutive. However, it is a viscus fluid flowing downhill. Warm it up, and it flows faster. One way to warm it up to let melt water on the surface accumulate, and drain through moulins. If we see something like that happening, then we know that Jakobshavn Glacier is going to flow faster. Since ice is very non-linear as it approaches its melting point, it is going to flow much faster. Moreover, Jakobshavn, is a flaw in the bulwark that supports the core of the GIS. When the bulwark is no longer strong enough to support the core of the GIS, then the core of the GIS will undergo progressive structural collapse. The fjord then provides a path of least resistance for the water/ice slurry that was the ice sheet. In glacial terms, this happens “instantly”. Yes, it will have complex behaviors, but sea level rise is the bottom line. Steve, it is papers like Joughin et al that caused me to stop citing. Thanks for the info - I can picture the halo siphon operating, the increased speed of the water over the sill would lower the pressure (Bernouli's principal), sucking ever more warm water from the depths. An increase in cold outflow would increase the warm inflow making for a powerful positive feedback during summer melt season. Not sure I understand the reasoning behind this one. Is it that you disagree with Joughin et al. analysis? There have been moulins draining through the GIS from supraglacial lakes for a long time. You have often made these points in the last years. Let’s assume you’re right. What do you think is the predictable future for S.K. and for the southern part of the GIS? If there’s nothing special about the plumbing today, what other processes could be able to drive SLR as predicted FI by Stefan Rahmstorf? I spit that ‘ fact’ about 50m, published 2011 from Swiss Camp out of my memory. Thank you for checking me, I’ll try to refind that and link the info. FWIW, given the mass loss in the last decade, it actually looks a bit off line to claim 50 cm. After all, the summer melt zone is probably about 600K. While GIS lost some 2200 Gt in the last decade, the upper limit of average sinking could only be 0,25 m. Nevertheless, in places 50 cm doesn’t sound ridiculous to me. There are two forces at work altering the ice sheet. The main cause of acceleration is due to thinning at the terminus and the resulting dynamic response. Icebergs are a much faster way of getting rid of ice than melting in place. Remember the acceleration is highest near the termini of large marine terminating outlet glaciers, and minor for land terminating glaciers. The fact that the response is largest for the larger glaciers does offer support for the idea that the thinning from subglacial melt is significant. This also suggests that the thinner marine terminating outlet glaciers would thin less and accelerate less and that has been the case. Epiq Sermia is another good example of the whole process. Note both the description I wrote with Dan Bailey at Skeptical Science and a recent paper I reviewed by Mernild et al 2012 note which five glaciers changed the most. The second big change is the expanding melt extent and melt rate which increases sea level rise, but also can foster dynamic changes through thinning. The dynamic changes would tend to reduce flow rates for areas without calving termini. The Sundal et al (2011) paper on velocity changes and plumbing is excellent. Aaron brings up an interesting point that almost never gets mentioned. Ice does in fact behave like a highly viscous fluid. And as the temperature of ice changes this viscosity can vary by many orders of magnitude. Steve Bloom asked me for a reference of my mentioning of 50 m elevation change at Swiss Camp. This morning I promest to look for it, after noodling around with the units (writing 50 cm then). New post over at NASA's Operation Icebridge blog. Global Hawk UAV's being tested to fly ice missions over the Arctic this Summer. It seems to be a bit out of date - as NASA's Thailand mission (Southeast Asia Composition, Cloud, Climate Coupling regional Study (SEAC4RS)) was canceled this week - due to the Thai parliament not getting their act together to approve the use of a military air-base. A question for Greenland connoisseurs & glacial historians: Were there special weather conditions there for the very low snow cover in late 60's summers [no data for 1969] on there [But for a B52 nuke carrier crashing off Thule on sea ice in 1968, no info.] This chart has an unthoughtof interesting eyeball trend... more snow as a response of more vapor cycling north (something which is presumed to also happen at the Antarctic). ... hours later, a renewed search from ponder, did eventually stumble on this piece... referring to Rutgers, the supplier of the snow data: http://notrickszone.com/2012/01/10/rutgers-university-greenland-snow-cover-expanding-since-1967-turning-white/ with low and behold the near same chart. This strikes me as one of the few NEGATIVE feedback processes of the arctic. The positive feedback mechanisms are oft-discussed and powerful, but there are still some negative-feedback effects in play. In places like Buffalo, NY, every winter gives enormous snowfalls from "lake effect snow." As a cold front moves over vast stretches of open water of the Great Lakes, water vapor from evaporation off the open water freezes in the atmosphere and falls as prodigious snow just downwind of the open water. We should expect to see this in Oct-Nov-Dec around the arctic with more open water there during these months. An obvious major recipient SHOULD be Greenland. I'd even expect significant year-on-year accumulation at upper elevations. Nevertheless, I'd expect the mass of ice in the depths of that ice sheet to gradually get warmer over time, becoming more plastic/fluid, increasing ice outflow from glaciers to (at some point) reach equilibrium with annual snowfall--and then exceed it, as the region gets warmer still. The effects on albedo might get complicated. More snow means Greenland starts each melt season as quite white. But probably some additional soot/black carbon gets deposited with that extra snow. A particular season of especially high melting/snow evaporation could still lead to dramatic darkening during any strong melt season (like this one). If this is all accurate,there should be testable hypotheses from this... particularly a trend towards increased early-winter precipitation in other northern lands. I have no insight in the history of snow cover on Greenland. I recall ten year old forecasts that climate change would not change equilibrium on the Greenland ice sheet. Ablation and calving at the periphery would be compensated through extra snowfall on the interior. Up to 2012 that forecast didn’t materialise. First, the pattern change in temperature/precipitation is much more complicated than the general approach supporting these old forecasts. Second, regional change is happening faster than supposed in a lot of regions. Third, on my CAD map Greenland has an area of 2,16 MK, the ice sheet covers about 1,66 MK, minimum summer snow cover is a lot smaller than that, last year around 1,41 MK. I don’t see that reflected in the Rutger’s chart. Maybe I’m not exact on the numbers. But I doubt whether a general trend to more snow cover for the whole island is accurate. And for the second point: the amount of melt days over a large part of the sheet has accumulated to an anomaly of 60 days in some regions. Of course, that wouldn’t melt all snow cover to the bare ice level. But as I digest the Rutgers’ graph, there must be something ‘wrong’ with a minimum snow cover of 2,06 MK summer 2011. I’m reading it wrong or the graph is cherrypicked? The most likely explanation - a large measurement error. Pixel size is comparable to the width of the ice-free coast of Greenland. Cherry Picked? Says at bottom that it's a 13 week moving average. Underlying, there truly is no week below 1.8 million km square reported after week 29 of 1996... 16 years ago. Below 1.9 million was last time week 35 of 1996. Anyway, made the weekly visible with a yellow plot, the 13Wk moving on top. Ctrl-F5, or whatever to see the refresh. To be honest, was and am puzzled about Rutgers' reporting at times, but that's for the Huffington Post columns. Anyway, thanks Steve C / Werther for your input... 1.4 million... maybe they use 15% concentration like see ice... it bares checking with other snow data maintainers. don't get me wrong please...I wouldn't blame cherrypicking on you. But I followed your link and found myself in the Notrickszone, where I never dwell. It smelled to me like denier-Daar (the land where the deluded live). So I thought that they might have misrepresented Rutgers data. For what it's worth, SekeRob, I still feel baffled when your last graph stipulates 2,03 MK for Greenland snow cover week 26. You can be sure I'll check that on MODIS/CAD. The NTZ site I kind of wholly ignored with FS commentaries to foot, but their chart [from source], was unfaked, else I'd never have linked to it. Much appreciate any snow evaluation input. Have emphasized the Greenland split from EurAsia/NA-minus-Greenland earlier today in a weather thread post where they were in the usual "those thermometers are faulting, wrong" mode of commentary. From 8.5 million in 1967 to just over 0.5 million km square for same week in 2012... the agricultural world around will have trouble to get irrigation water later this growing season in many places, lest it pours rain of course. The NOAA maps are digitized on a weekly basis using the National Meteorological Center Limited-Area Fine Mesh grid. This is an 89 x 89 cell Northern Hemisphere grid, with cell resolution ranging from 16,000 sq. km to 42,000 sq. km. If a cell is interpreted to be at least fifty percent snow covered it is considered to be completely covered, otherwise it is considered to be snowfree. In the early years NOAA interpreted snow cover from photographic material in a resolution of about 4 km, since '78 they use AVHRR (1,1 km). My take on this: the Rutgers/NOAA material is perfect for large scale Northern Hemispheric continental trend/comparison. It cannot be used to assess detailed snow cover over specific areas. In June 1999 NOAA ceased production of weekly snow maps. IMS daily snow charts are now produced at NIC and utilized at Rutgers to create a unique Northern Hemisphere snow cover product. Using Perl software created at the GSL, weekly and monthly 89x89 grid cell charts are generated. In this procedure, weekly areas are calculated from digitized snow files, and monthly values are calculated by weighting the weekly areas according to the number of days of a map week falling in the given month. During this process, the 24 km resolution IMS daily snow product is reduced and subjected to filtering through the corrected land mask created here at the GSL. The result is a Climate Data Record (CDR) that details Northern Hemisphere snow cover over the last 46 years. That's 576 km square grids. I had noticed BTW, that Rutgers redid the data in Sept. 2009, upwardly adjusted values back to the beginning [note in my data sets] At least, their weekly data suggests greater refinement than such large 16-42K Km square blocks. The last 5 known weeks, to the km exact. Net, there is a seeming gap between the reported and observed snow cover for Greenland. Going to do the prescribed 8 hours shuteye before looking further into this. This illustrates recent elevation sinking around Sermeq Kujalleq. Maybe this will add to the darkness? Until a few years ago it were just simple on/off blocks, anomalies represented by red squares, now shown with more refined hues. 2) the more accurate calculations that feed for instance into the publicly available datasets, which is what I'm using. Global Warming / Aerosol pollution(?) winters. Check on Sermeq Kujalleq day 192. Fact: Sondre Stromfjord reported 24.2 dC max today. >"For what it's worth, SekeRob, I still feel baffled when your last graph stipulates 2,03 MK for Greenland snow cover week 26. You can be sure I'll check that on MODIS/CAD." Snow seems a bit extensive covering practically all Greenland for July. With that sort of measure of snow cover, I wonder how the area changes at all. Greenland is 2,166,086 km2 of size, and just a fast glance at MODIS, will tell that a snowcover of 2,03 MK is SO far out, and what is defined as Snow? Also ice beneath the now melted wintersnow? Werther: I also took notice of the 24,3 C yesterday! So far in Oslo this July we've had only 1 day surpassing that, but the summer over here is also close to a disaster...the negative AO values seem to hit the north-west part of Europe hard. It's a now proven fact that the Vikings once populating eastern Greenland, had to move due to a ca. 2 C drop in yearly temperature, so they would most likely nod approvingly to the weather nowadays! At Summit Station +0.7С. In radar images the northern dome began to darken. Christoffer, where did you get that info about Nordic settlers in the eastern Greenland? I have always thought they resided from southern tip to somewhere near Nook. That is in the west. (with evidence of visits to far further north and of course all the way to Newfoundland southwest) I was in the impressions archaeological remains from the eastern coast were connected to Inuits. Oops, in my head I thought west, but wrote east, SORRY about that! They resided mainly in two strongholds, whereupon the southernmost was clearly the largest. Did this get proper attention? "This reflectivity progressively reduces during the sunlit (warm) season as a consequence of ice grain growth, resulting in a self-amplifying albedo decrease, a positive feedback." One of the articles on Greenland darkening had an illustration of how the ice crystals change shape over time, but I'm unable to find it now. You mean this image, I think. But I admit I could have given the changing structure of snow crystals some more attention. Worth adding to your write-up? That picture of "old" snow or ice remind me of easter snow in Norway (if it still exist at that time! ), and that snow is very corny and rotten, often filled with dirt, thereby also reducing albedo. Snow/ice at this part of the lifecycle is very prone to melt away fast, thus a super strong positive feedback! Any articles or reports dealing with speculation about the meltdown rate currently taking place at Greenland? I’ve been thinking on that, extrapolating from the Sermeq Kujalleq surface lowering pics above. I used an area of about 15000 km2 around the glacier and assumed a meter mean lowering for 2012. That would account for a loss of 15 Gt. That’s not all of the loss; glacier calving on high velocity is the main part. For SK, actual retreat 2012 stands at some 16 km2 (12 S -, 4 N front) and the velocity would have added at least 4 km2 since the start of the melt season. I assume a front thickness of at least 300 m. The outcome could be 6 km3. For the SK region the season might already be at 21 Gt. This is the most ‘productive’ region. So for the total melt zone, about 300K, I would extrapolate 300/15 = 20 times 21 = 420 Gt already. I expect a new record on yearly loss, it might even be as big as 700 Gt. I would assume a gradual acceleration to 4000 Gt yearly within 10 years if this process continues. Right on track for the SL predictions by FI Stefan Rahmstorf. Well, the flaw in my math is, of course, that calving 'should' be the main part. In my calc it isn't. Maybe calving/velocity produces much more than 6 Gt. 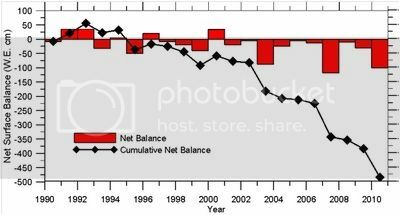 But stuctural lowering of the melt zone below the equilibrium line is becoming obvious? Frankly, I'm not going to opine how *on* or *off* the Rutgers product is [for Greenland]. What they appear to have done is making the data over the live of this product since start in 1966 as consistent as they could and think we can all agree that the global warming > more snow precipitation on Greenland is fact. How much it holds on dirtied top I'll leave the experts to analyze. For my part, I've split out Greenland, which then leaves there to be very little left at end of June on the Northern Hemisphere, as per this chart I posted earlier: http://i137.photobucket.com/albums/q210/Sekerob/Climate/Snow_Cover_Season_NH_Wk26.png ... just 0.51 million KM left on land at the height of meteorological summer. + 2,2 at Summit yesterday! And the massive meltdown start crippling the communities at the western coast of Greenland. Bernard Valent fixed attention on the sediment loaded waters. It is clear that melt water can somehow get loaded with silt right under the sheet margin. This is taken out into these fjords. It reaches 60-120 km far. Further out, the colour turns light blue-green, suggesting fine clay and algae. Christoffer, this coincides remarkably with the content of your comment. How unusual is this, Christoffer? I might do a post on this in the coming days. Pretty spectacular what's going on there. And of course pretty awful for the local population. As shown in the video you can see above, there is little to suggest that the situation improved in Kangerlussuaq provisional. The water strikes with enough force into the bridges, which for a few days ago connecting the north and south of Kangerlussuaq. Checking with 2011 and 2010, wow. With all the data we are getting. How much water are we talking here? we saw 500-600 GT of ice loss the last couple of years, are we possibly looking at 1000GT this year? We are going to see the Sea Level Rise respond after this year. According to the historic weather dating back to 2003, such has not happened in July at Summit! So it ought to be worth a post! The amount of runoff near Kangerlussuaq, West Greenland in that Watson River is also shown here. The meltwater outflow is exceeding the rivers historic holding capacity. ice sheet, meltwater collects in the proglacial melt river that runs past Kangerlussuaq. The freshwater discharge as measured at the bridge over Watson River in Kangerlussuaq is also illustrated in Fig. 8." Friday the 13'th, an omen... Well, only for the Greenland glaciers! Also today the temperature at Summit, 3200 meters above sealevel!, reached at least +2, so one might just imagine the meltrate a little lower in the terrain! An exellent article Philippe! Btw, there is quite a few on this blog being not-native english speaking! Even Neven himself I believe! The article in danish (similar to norwegian! ), tell about 3.500.000 liters per second passing the now ruined bridge in Kangerlussaq, the former record was like 2.000.000 liter! While reading all the new info, I wrote this entry about ‘new’ info I gathered. The article by Philippe Terrier lead me to load day 191 2010 under my Ilulissat CAD. To kick in the obvious: the equilibrium line then was 35 km less away from the calving front than now ( 60 – 95 km). The four lakes that emptied three days ago weren’t there or were slight grey features. When I checked the distance on G Earth, the height indicator showed 1600 m! It all indicates that we are witnessing very strong impact. By Ben Linhoff, Woods Hole (this man describes what’s going on as if you’re there yourself on twitter). Christoffer, 470 m3/sec feels better than 3500, as that last amount would be three times the normal discharge of the Rhine at the Dutch/German border. FI 2 months of that discharge would release about 10 Gt in a month. At 470, Watson river would app. conduct 4 Gt/season to the Labrador Sea/Baffin Bay. Big time anyway! Paper linked above by Philippe says 6.6 +/- 1 KM^3/year for 2010. That is a steady rate of 209 m^3 per sec but it won't be steady so peak rate will be rather higher. Paper has a graph showing peak rate in 2010 at about .12km^3 per day. That is nearly 1400m^3 per sec. If 1400m^3/s or maybe a bit more didn't cause bridge to collapse in 2 places in 2010 then 2012 is likely to be a faster flow rate. Maybe 3500m^3/sec is a little high but 470m^3/s seems too low. Re:- Watson River. Flow is said to be 3,500,000 litres/sec = 3,500m^3/sec = tonnes/sec. Think I saw flow of 9m/sec, would need a cross-section of 400m^2 to give the volume. Is that likely from the bridges design - they looked fairly high above the river in one picture I found? Thanks to everyone for the links and comments. "When a cliff collapsed in June in Glacier Bay National Park in Alaska, it sent rock and ice coursing down a valley and over a lovely white glacier in what could be one of the largest landslides recorded in North America. Drake Olson took this picture July 6." How much solar energy do you think that vast black expanse is absorbing? The landslide covered a section of the glacier estimated at 800 metres wide and 8.5 km long. Click on the image above to go to the web article hosted by the Vancouver Sun. Pretty massive I must admit! >How much solar energy do you think that vast black expanse is absorbing? Based on July insolation in Anchorage of 210 w/sq m (24hr average), an area of 6.8 million sq m, and a fairly conservative albedo flip of 0.7, thats a handy 1000 MW being soaked up by the new black blanket, enough to melt 3 tonnes of ice per second, or 260,000 tonnes per day. That would melt about 4 cm per day from the thickness of the glacier. That's for July insolation, of course. Assuming it gets covered in snow in mid-October, it should lose about 1.2 metres of ice before winter. And then double that until it gets washed away / dispersed / permanently covered by snow/ice. "double that amount per year"